Do you have a Sonic Skin Brush? These amazing Sonic Brushes have been available both in our salon and online store for some time now, but they remain both a top seller and a staff favorite. Do you have one yet?! It will absolutely revolutionize the way you care for your skin! 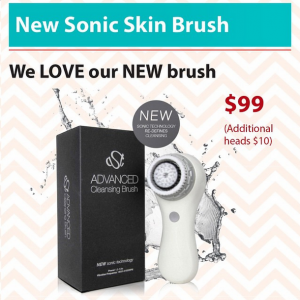 The Sonic Skin Brush is made by Aspect, which is one of our very favorite brands. They’ve produced a highly effective cleansing brush that has the power and features to leave your skin feeling clean and fresh! Using SONIC TECHNOLOGY the brush works with the skins natural elasticity to beautifully transform skins texture and appearance- it’s so effective that most people notice results after just one use. At just $99 this is a simple investment to make for the long term health and benefit of your skin! Shop it here.